It’s been a while since our last post, but watching the reaction to recent volatility has given us inspiration. The big stock sell-off in quarter 4 of 2018 illustrated, yet again, why forecasters and traders get things wrong. The error was the hidden assumption that market participants (in this case, the US Federal Reserve) won’t react to the observed trend. That the US Federal Reserve will continue to raise interest rates on “its schedule” even if the US economic growth has slowed. It is however better to look at how participants, like the Fed might react, and where that will lead. This is a lesson that is useful to investors as well as economic forecasters. Here are some examples and discussions from famous investors and then practical ideas on how to improve investment returns, particularly in extreme conditions. 1. Be greedy when others are fearful. One of Warren Buffett’s best quotes (and he has many) is “Be fearful when others are greedy and greedy when others are fearful”. If you could summarize a good investment strategy in just one sentence, then this is one of the best. Most retail and even many institutional investors fail quite badly to invest when the headlines scream “stock market falls”, but the key to remember is that you are looking at the prices today (lower than before) and the profits in the future (99.99% certain to rebound). 2. 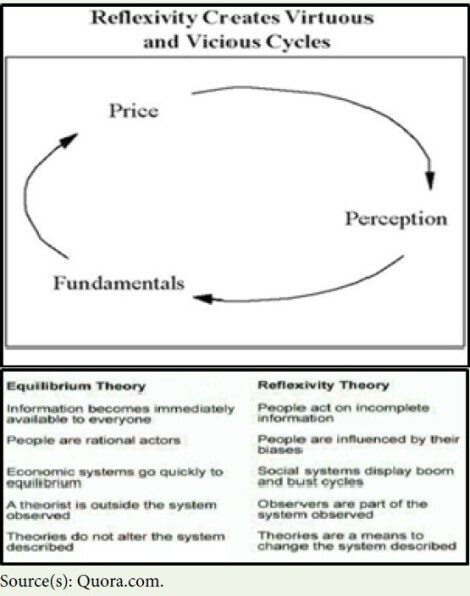 Soros’s Investment Philosophy – Reflexability. You may know billionaire George Soros as an incredibly successful investor, but may not be aware he fancies himself as a philosopher. He even wrote a philosophy book “Reflexability and Economics” which, like much philosophy isn’t an enjoyable light read: so here’s our summary because Reflexability works far better as an investment theory than philosophy. Essentially Soros argues that extreme market conditions and people’s observation and reaction to them contain the seeds of their own rebound/continuation. That “observation of the economy leads to ideas that change behavior, which in turn changes (is directed back upon) the economy itself”. To give a recent example, that the interest rate rises are causing a slowing economy, which the Federal Reserve notices, and then changes course. Are you still worried that the Chinese government won’t react to a poor Chinese economy? 3. Observations and Reactions aren’t always a good thing. Participants reacting to a change doesn’t always lead to a bounce-back. Sometimes it creates a negative spiral or doom loop. Worse, a lot of investment theories and algorithms based on efficient market hypothesis, which is very good during normal market conditions, can get it badly wrong during extreme conditions. Here are just a couple of examples. a. For example the assumption that correlations (or lack of correlation) is a broadly stable factor was a big part of the reason that one of the most famous, and previously successful hedge funds, (Long Term Capital Management) went bust in the late 90’s. A Russian bond default turned investors against all emerging markets and risk assets, changing unrelated assets to correlated, almost overnight. Yet experienced investors have long had the expression, “when times are tough, correlations turn to 1 (aka everything falls together). b. Another hidden assumption is that markets will always trade and a willing buyer and seller can always be found. Yet in bad times, more obscure markets can sometimes fail and trading stops. For example during the financial crisis the multi-billion dollar mortgage backed security market turned from a huge industry to a ghost town in the blink of an eye. Trading had all but ceased by October of 2008 when there were only sellers and no buyers. Stop loss orders don’t work when no-one’s buying. In both of these cases, and many others, the market level can go far beyond a normal rational level. People who bought US property at the bottom of the crisis did very well in most (although not every city), in the same way those brave few who bought stocks in early 2009 quickly made strong returns that year. That is nothing however compared to a few hardy investment managers who bought mortgage backed securities in early 2009 for a handful of cents on the dollar. Despite the historic levels of mortgage default still managed make 500-2,000% returns as the market for these securities gradually returned over the following years. Still, you need knowledge and a very strong stomach to buy at the bottom. But how can you stiffen your spine when the media is screaming doom? 4. Create a plan to avoid being driven by emotions. It’s an uncomfortable but important truth that investment decisions, aka decisions under uncertainty, are made in the emotional center of the brain, called the pre-frontal cortex (google it). All of us aren’t as rational as we think, or hope. Our brains work against our goals by going to “flight or fight” at the wrong time. Planning ahead what your investment approach will be during times of market stress is thus vital. It means that the decision has already made. Thus “if the stock market falls 15% then sell x% of bonds and buy stocks/equities” you simply need to execute the plan rather than decide. This will help you tune out the noise of the media and market and focus on your goals. Staying rational whilst others go emotional is an advantage. Or as Buffett’s sidekick Charlie Munger described his advantage as “I’m rational”. Planning will help you become more rational too. 5. Periodic Rebalancing – A rational plan. There are two main ways an investor can create a rebalancing plan. 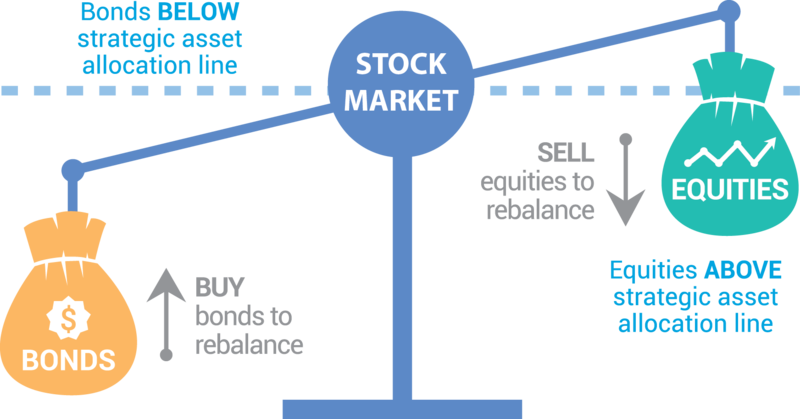 The first is conditional rebalancing as mentioned above, where a portfolio holdings are rebalanced back to the intended level when a pre-set benchmark is breached. Thus if equities rise strongly and are now 75% of the portfolio, rather than the intended 70%, then some equities are sold and bonds are bought. Or vice versa. This often has the effect of selling equities at a high level and buying a cheaper asset at a lower level. When markets reverse and fall, and equities fall to say 60%, instead of the intended 70%, then bonds are sold and equities are bought. Again, this often means you are buying low. The second approach is similar but the decision making is based on timeframe to consider rebalancing rather than waiting for a threshold to be breached. Thus a portfolio could be rebalanced annually or bi-annually, depending on what you decide. Both approaches are fine, but the key is decide and then stick to your approach, no matter what happens in the controversy driven media of today. Caterer Goodman Partners is a Shanghai based wealth management firm established with a clear vision to provide a new level of personalized financial planning services for expatriates in Asia. Our financial advisors provide guidance for our clients in all areas of investment, specialising in managed accounts, money-market funds, retirement planning and alternative investments. At Caterer Goodman Partners, we offer our advice and experience to provide low cost, tax-effective and simple solutions to match our clients' interests. Since graduation Mr Owen Caterer has worked with the Queensland Premier's Department in Trade Facilitation and then as a financial adviser in Shanghai from 2005 until 2010. He then rose to Senior Adviser, then Business Development manager and then to Chief Investment Officer responsible for portfolios to a value of US$280 million across Asia. Following that Mr Caterer left to found his own firm with a partner in the financial advisory and wealth management area. This focused on developing China and Asia's first fee-based financial advisory (rather than commission-based). This has grown to now have 8 staff and and managing almost US$35 million for clients throughout Asia. This business success was recognized as a finalist in the 2013 ACBA in the Start Up Enterprises category and are one of a small number of foreign managed firms to have a full asset management license in China. Owen has also been active in the community volunteering for the Australian Chamber of Commerce in Shanghai and acting as the Vice-Chair of the Small Business Working Group (2012-2014) and as the Co-Deputy Chair of the Financial Services since 2013 until the present. They have continued to grow their business and havenow been selected as a small group of companies who are platinum members of the Australian chamber of commerce. The achievement they are most proud of is their efforts to reform the financial planning industry in China and push it away from a hard-sales commission driven model to a more ethical management fee and long term customer service model. Owen has a Graduate Diploma of Applied Finance from the Securities Institute of Australia of which he was a member as a Fellow of Finance for many years and also has an undergraduate degree from Griffith University in International Business. Owen's interests are tennis, running and his wife and two children. He speaks fluent Chinese, first arriving in China in 1997.